Oh man, if you're looking for new shoes, I have a deal for you. 6pm.com's Summer Sole-Stice Sale is discounting over 2900 pairs of shoes through Sunday, and all orders come with FREE shipping. Pick from over 100 brands and almost too-many styles. Everything from ladies pumps from Nine West to jogging shoes from New Balance are included. 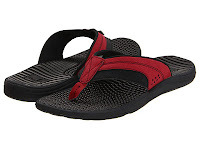 I do need a new pair of flip-flops, and they have high-end ones at 65% OFF. What's a high-end flip-flop look like? They're right there in the picture. Man, I think I can go play tennis in those things!